Local, Nicholas Jimenez Jr., Brings Spotluck to Danbury. There is such a strong sense of community and so many great restaurants; it’s a perfect fit for Spotluck’s mission of helping locally-owned businesses. After successfully launching in large metropolitan areas like New York City and Washington, DC, Spotluck has turned its attention to smaller, suburban cities. 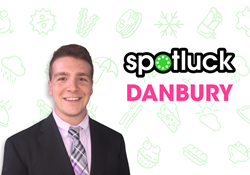 Danbury is the latest stop on Spotluck’s expansion, debuting on February 1st. Spotluck works exclusively with locally-owned restaurants and offers savings from 10% - 35% off your bill along with an exciting “spin” on deciding where to eat. Danbury will be the first Connecticut market for Spotluck, which already operates in other East Coast states. Nicholas Jimenez Jr. is spearheading Spotluck’s launch in Danbury. Jimenez grew up in nearby New Milford and has deep roots in Danbury, with three generations of family members calling the city home (and operating a small business - The Place Cafe - for 35 years). In Danbury, participating locations include The Cue, Widow Brown’s Cafe, Barbarie’s Black Angus Grill, Mazzo Mozzarella & Wine Bar, Pippa’s Sport Cafe, Square One Bar & Grill, Pour Me Coffee & Wine, Three Brothers Diner, New Holiday Diner, Michael Angelo’s Pizzeria, Atlantic Restaurant, Niko’s Grill & Subs, Lorenzo’s Pizzeria, Le’s Kitchen, and Ruchi. Spotluck first launched in 2014 and has grown to partner with nearly 1,500 local restaurants in and around New York, New Jersey, Delaware, Washington DC, Pennsylvania, Virginia, Maryland and starting today, Connecticut. Spotluck brings dynamic pricing to the restaurant industry with a gamified spin. Spotluck pioneered real-time discounts that fluctuate based on day, time, weather and other factors that impact restaurant occupancy. Their software yields higher discounts on rainy Mondays and lower discounts on sunny weekends. Spotluck’s gamified spin on deciding where to eat makes the app fun for users, while its proprietary software maximizes occupancy (and profits) for local restaurants through smart discounts that change. Spotluck is currently ranked as a top “dining” app on the iTunes App Store. The app is free for consumers and available on both iOS and Android. More information can be found on http://www.spotluck.com.